Touchpads for setting oven temperature. Oven can be controlled wirelessly from smartphone. 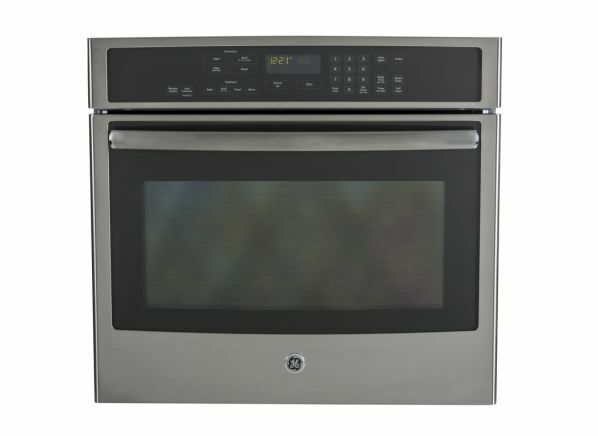 The GE Profile PT9050SFSS is part of the Wall Oven test program at Consumer Reports. In our lab tests, Wall Oven models like the Profile PT9050SFSS are rated on multiple criteria, such as those listed below. Results in the following chart are gathered from Consumer Reports’ 2018 Spring Survey of 12,581 electric wall ovens, owned by members who purchased a new unit between 2008 and 2018. Our predicted reliability ratings are based on a statistical model that estimates problem rates within the first 5 years of ownership, for electric wall ovens that are not covered by an extended warranty or service contract. We also adjust for the number of days of use per week. The median in our survey was 5 days per week. Higher ratings are indicative of better reliability. Brands receiving a red or orange rating cannot be recommended by CR at this time. Our owner satisfaction ratings are based on the proportion of members who are extremely likely to recommend their electric wall oven to friends and family. Width (in.) Width This measurement indicates the width of the front of the oven in inches. It does not indicate the necessary size of the cabinet cut-out, which is model dependent. Note that a wall oven will typically fit into the same size or wider cabinet. Covered element Covered element Smooth cover or floor over the bottom baking element makes for easier cleanup of drips and spills. Convection mode Convection mode Has a convection feature that uses a fan or two to circulate heated air, and sometimes an extra heating element. The convection mode can be turned off if you prefer conventional cooking. Temperature probe Temperature probe A temperature probe is an electronic thermometer that can be inserted into cuts of meat. It allows for the internal temperature of the food to be displayed on the control panel and for users to control the oven. Stainless steel Stainless steel Indicates a stainless-steel surface. Cooktops and wall ovens that offer it are noted so you can match both appliances.